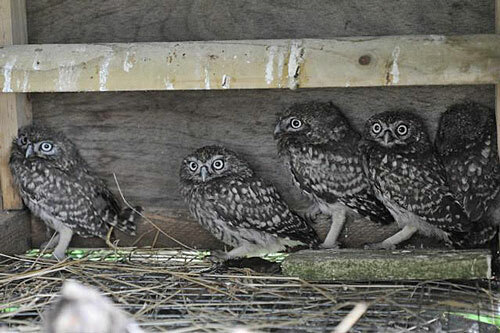 As you may recall, four young Little Owls were recently brought into the owl sanctuary’s raptor hospital by a member of the public. The owlets’ parents had been killed by a fox and the four babies left defenceless in their nest in an old tree stump. Having narrowly escaped the same fate as their parents, we undertook to look after them until old enough to be released back into the wild. Through making contact with the Sanctuary regarding this incident, Heather - the owner of the land where the owls were found, became interested in becoming more involved with our rehabilitation work. To this end, she invited Centre Manager Andy Hulme to assess the habitat surrounding her home with a view to siting some hack boxes there. Hack boxes are wooden structures, not unlike owl nest boxes, but with the addition of a removable mesh extension, allowing the birds a vantage point from which to acclimatise to the natural environment. The birds are initially fed in the hack box but once they grow stronger the mesh side is removed,allowing birds freedom of movement between the secure enclosed environment and the “big outside world”! The guardian of the box will continue to provide food for the birds, within the box, so that they have sustenance until confident enough to leave and live independently. Andy found the habitat in this particular location to be ideal for supporting owls, as the entire grounds of the residence were given over to organic hayfields. Indeed, the land is so enriched and unspoilt that a huge diversity of wild flowers, including bee orchids, are flourishing there. Consequently, an abundance of food enjoyed by Tawny and Little Owls is readily available and both a young plantation and a mature wood provide a valuable variety of environment. The site is peaceful and undisturbed and, helpfully, the owner keeps no dogs, cats or other intrusive domestic animals. Now We Are Five - our four 'outfoxed' Little Owls plus an additional one prepare for the off! Subsequently an orphaned young Tawny was brought into us and this too has been hacked back to the wild using the new site. S.O.S. is indebted to Heather (who now contributes to our Facebook page) and others like her who engage in this rehabilitation process in order to offer rescued birds the “second chance” that they so obviously deserve. Thank you!